It’s 2.03 pm on a beautiful, sunny, late summer day, the 25th August 1952 and an express train races across Sulgrave embankment. The photographer, standing at the end of Little Street, peers through the viewfinder and presses the button on his camera. Click, the above photograph is taken. Once upon a time, this would have been the limit of our knowledge about the photograph, but the age of information technology has changed all that. 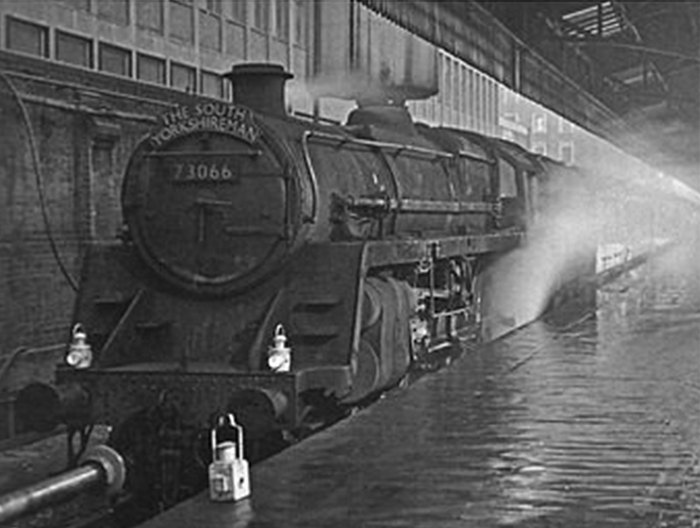 The 1952 timetable shows that the train was the “South Yorkshireman” which had left Bradford, hardly in South Yorkshire, at 10 am bound for London Marylebone, via Huddersfield, Sheffield, Nottingham, Loughborough, Leicester, Rugby and Aylesbury. A framed copy of the photograph was kindly loaned by Christopher Henn. Research into the photograph by Sulgrave villager and author Chris Behan is set out above and continues on the next page. Travelling at 75 mph, the maximum speed along Sulgrave embankment, the train was on time and London Marylebone would have been reached at 3.29 pm, its advertised arrival time. Five hours and 29 minutes from Bradford to London is hardly express. The equivalent Great Central train in 1903 left Bradford at 10.07 am. It traveled over the same route as the 1952 service, but with additional stops at Halifax, Woodford and Hinton (renamed Woodford Halse in 1948) and Brackley, arriving in London at 3.05 pm. 31 minutes faster than in 1952. Today, a Grand Central (no, not a mistake) express train leaves Bradford for London King’s Cross via Doncaster at 10.21 am and arrives at 1.43 pm. A journey time of 3 hours and 22 minutes. Now that is an express train. The 1952 train left Bradford with nine coaches, painted in the “blood and custard” livery first introduced in 1949. It was hauled by an LMS Black 5, 4-6-0 locomotive. On arrival at Sheffield Victoria station the crew and the locomotive were changed, a Leicester based LNER A3, 4-6-2 replacing the Black 5. In addition, two restaurant coaches, also in “blood and custard” livery, were added to the train. The new crew and locomotive took the train to Leicester where a further change was made. Another crew and A3 took the train on its final section of the journey to London Marylebone. Sadly, the identity of the A3 in the photograph may never be known, but we have two clues. Eight A3s were based at Leicester on that day. These eight locomotives, we’re all named after racehorses, one of them being “Flying Scotsman”. They were used to provide the motive power on all the express trains to and from London Marylebone to Sheffield and Manchester. There is also photographic evidence that “Flying Scotsman” was rostered to haul the “South Yorkshireman” from Leicester to London Marylebone in July 1952. Did this roster apply through August? We can but dream. A morning service, a lunchtime service and an evening service to and from Manchester London Road (now named Manchester Piccadilly) via Sheffield. The “Master Cutler” express to and from Sheffield Victoria. 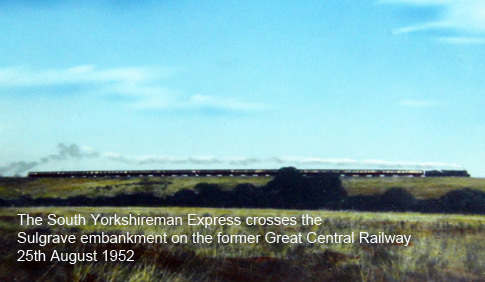 The “South Yorkshireman” express to and from Bradford via Sheffield. And a night service to and from Liverpool Central via Manchester and Sheffield. It left Liverpool at 9.30 pm and arrived in London at 5.05 am. Interestingly in 1903 it arrived one hour and twenty-five minutes earlier. The commercial justification for this service has always escaped me. Was it to carry mailbags from the North West to London and vice versa or even London newspapers for the Midlands and the North? 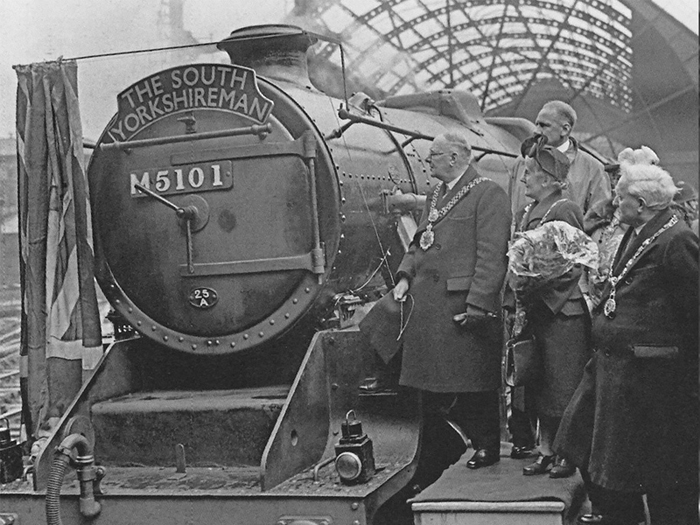 The line the “South Yorkshireman” ran along was the London Extension of the Manchester Sheffield and Lincolnshire Railway (MSLR), from its most southerly point, Nottingham. Affectionately know as the “The Last Main Line”, it was the brain child of Sir Edward Watkin, Chairman of the MSLR, who had ambitions in the late 19th century of building a high speed railway line from Manchester and Sheffield to Paris via London and a channel tunnel. A Victorian HS1, 2 and 3 all rolled into one. His dream only reached London. Nothing ever changes. The proposed line was met with many objections, but unlike today, few from the general public, but more from the landowners and other railway companies. Unexpected however, was the vociferous opposition of the artists of St John’s Wood and the Marylebone Cricket Club. The MSLR tried to buy the Lord’s Cricket Ground for its railway line into Marylebone. After a huge rumpus, an agreement was reached whereby a cut and cover tunnel was built to carry the line under a nursery. The construction of the tunnel was not too dissimilar to the proposed HS2 tunnel bypassing Greatworth. The nursery, a real fruit and vegetable nursery, eventually became MCC’s practice ground. Since then, it has been immortalised by the northeastern side of the ground, where the new media centre is situated, being known as the Nursery End. In Brackley, the MSLR planned to build a locomotive shed and workshops. The opposition to this was considerable and was lead by the Squire of Turweston, John Locke Stratton, a major landowner, and Mayor of Brackley. The MSLR decided not to fight the opposition and constructed their engine depot at Woodford. When it was opened in 1897, the Company changed its name to the Great Central Railway. At the same time the headquarters of the Railway was moved from Manchester to London Marylebone. The London Extension was engineered to an extremely high standard and to a generous loading gauge, not dissimilar to those planned for HS2. In retrospect, the railway line was over 100 years before its time. For instance, there were no level crossings on the line, which has only recently become standard practice on British railways. The line was never a success, due to the unpopulated countryside it traversed once it left Leicester and the intense competition from other railway lines. Passengers traveling from Manchester, Sheffield, Nottingham and Leicester to London had a choice of two railway companies to use. The dream of Sir Edward Watkin, in business terms is questionable, and it could be argued that it should never have been built, but strangely, there is now a view that it should never have been closed. The Great Central’s motto was “Forward”. Sadly, it did not turn out to be, “onward so as to make progress”. Chris would be grateful for any information in respect of photographs of the former Great Central Railway Line around Sulgrave, Helmdon and Woodford Halse. With the owner’s permission, any such photographs could be quickly copied and returned. See details of Chris Behan’s latest book “Exploring Midsomer – The towns and villages at the murderous heart of England”. This entry was posted on Saturday, January 9th, 2016 at 10:55 am	and is filed under News. You can follow any responses to this entry through the RSS 2.0 feed. You can leave a response, or trackback from your own site. There is a Facebook page “Old Pictures of Woodford Halse and Byfield” where I took the liberty of posting a link to this article. The railway is often mentioned by members of that page….